I’m sure many of you know Jenna from Rain on a Tin Roof. 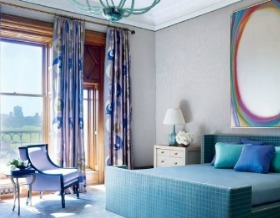 Jenna is an avid DIYer with a penchant for bold colors. She’s a little crazy, ok maybe a lot crazy. 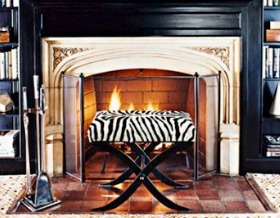 And she does fabulous projects with Velvet Finishes! Visit our roof cleaning blog to keep updated. 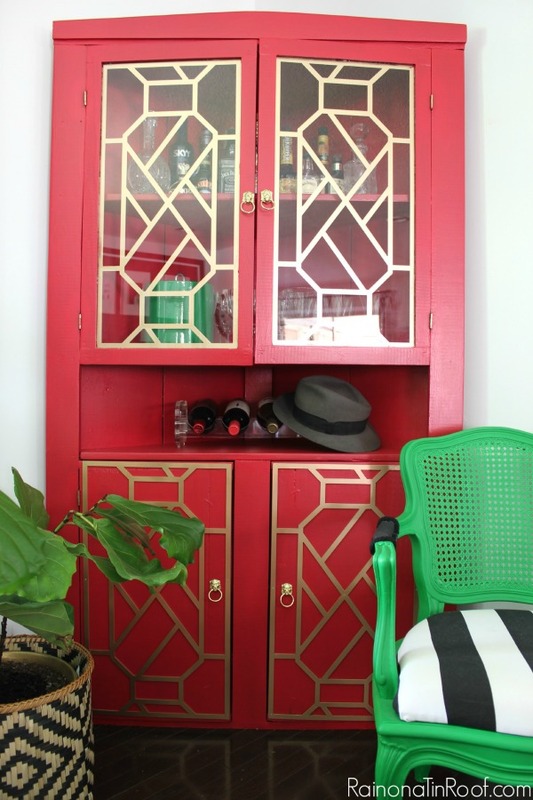 Here’s one of my favorites…her liquor cabinet makeover. This was done with Velvet Finishes Vivid. Jenna and I live about 30 miles apart. 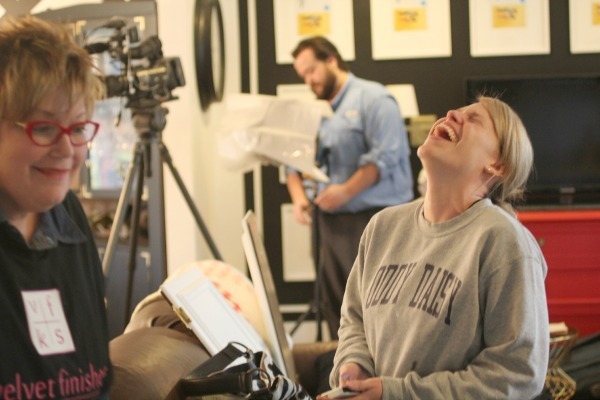 I look a little wacko in this picture…no telling what Jenna had said. 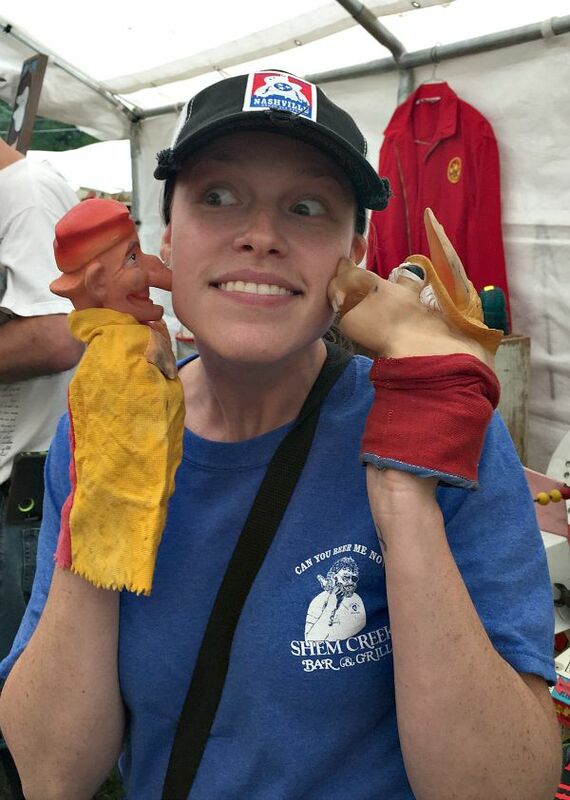 She is totally crazy normal! There will be no pictures of that. But earlier this year, we redid her kitchen together. 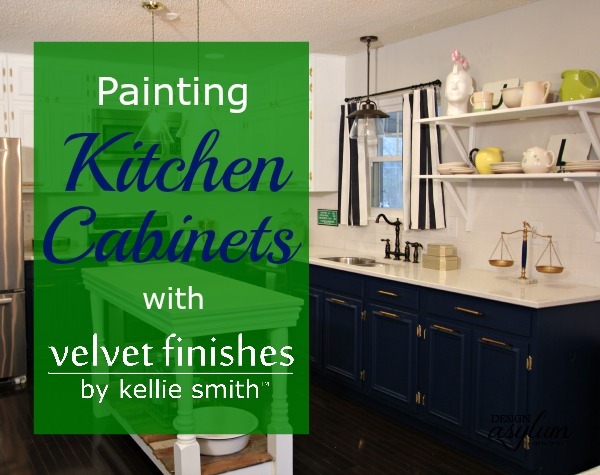 Paint Kitchen Cabinets with Velvet Finishes! Jenna and her husband, a.k.a. Grunt Labor, bought a foreclosure that needed quite a bit of work. They removed the wall that divided the kitchen and the den to open up the space. They painted everything a neutral white to make it livable, knowing there would be style evolutions, after all the work they did you can obviouly guessed there was a mess, but with house cleaning ann arbor they were able to get rid of the mess and get a clean space very quick. This is the kitchen while it was white. Pretty, but not Jenna’s true style. Jenna wanted to do two colors, Minimalistic (white) for the upper cabinets and Handsome (navy) for the lower cabinets as she saw at https://lounginglizards.com.au/. First of all it’s gorgeous. And it’s gorgeous because it is a pure white tint. There are no undertones of blue or yellow or peach or pink. It’s true white. Because there are barely any pigments needed to create this, it is thin. Minimalistic usually requires 4 coats. If you look at the before picture, you will see a slight blue tint on Jenna’s white cabinets. That is not lighting, the blue is the tint of the white. Whites are tricky. And that is why I wanted a pure white. Because in paint…white is never white. 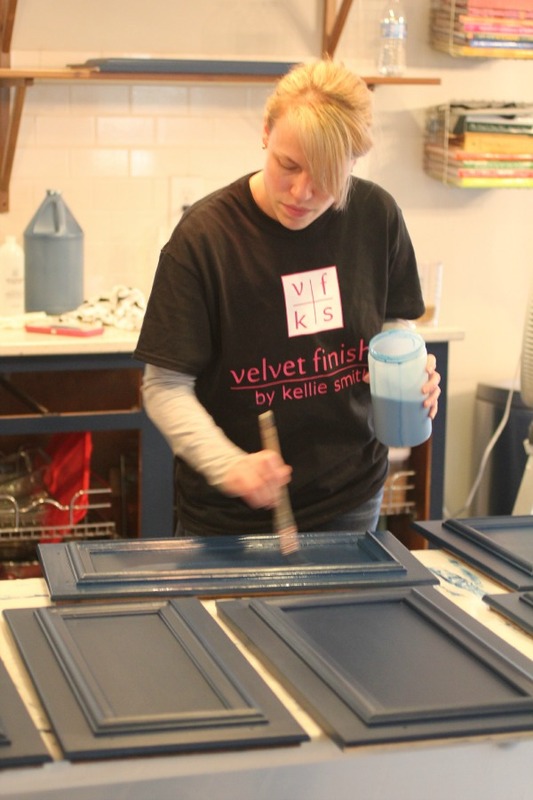 Velvet Finishes is an easy 1-2-3 system. Ready is our cleaner and deglosser spray product. Spray it on, let it sit for a minute, wipe it off with a lint free rag. Can’t get much simpler than that. Sanding and priming is a thing of the past with Ready. Never say never, but I will say rarely. Sometimes, especially with old pieces, you might have to sand a little or use a primer if there is a stain that bleeds through paint, but 99 out of a 100 times, the Ready will handle your prep. 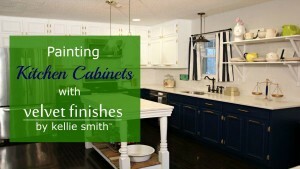 We do recommend that you do this process twice for cabinetry. 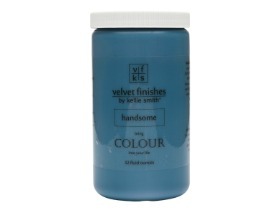 Velvet Finishes is very forgiving. If I can paint with this paint, anyone can! Allow paint to dry thoroughly between coats. I definitely recommend that you use Protect or Glaze on cabinetry. Cabinets take a lot of use and abuse. Protect is our polyacrylic and the Glaze acts like a sealer. Use one or the other. You can skip this for furniture, depending on the amount of use your piece gets. However, I use Protect or the Glaze on everything I paint because we are rough! 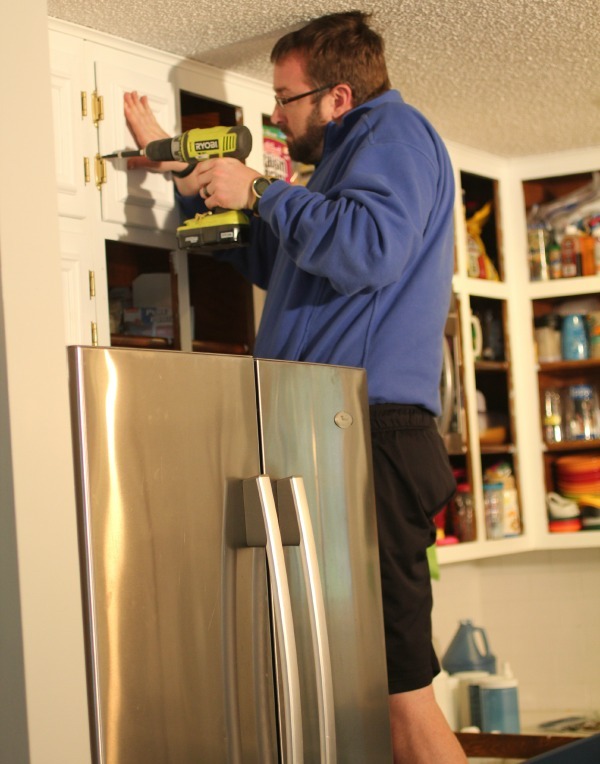 We removed the doors of the cabinetry and prepared them with Ready. We did not remove the food or pots and pans out of the cabinets so instead of spraying the Ready, we sprayed it on a rag, then wiped down the frames. We used Frog Tape to tape around the frames against the wall and floor. We painted the doors and frames. These doors have two coats of Handsome. Using poly is never easy. It can streak. The Protect product is a slightly higher sheen than the paint so when I poly the darker colors, I always tint the Protect with a little bit of the paint. It makes it easier and allows me to apply the Protect as quickly as I do the paint. Jenna is applying the tinted Protect. 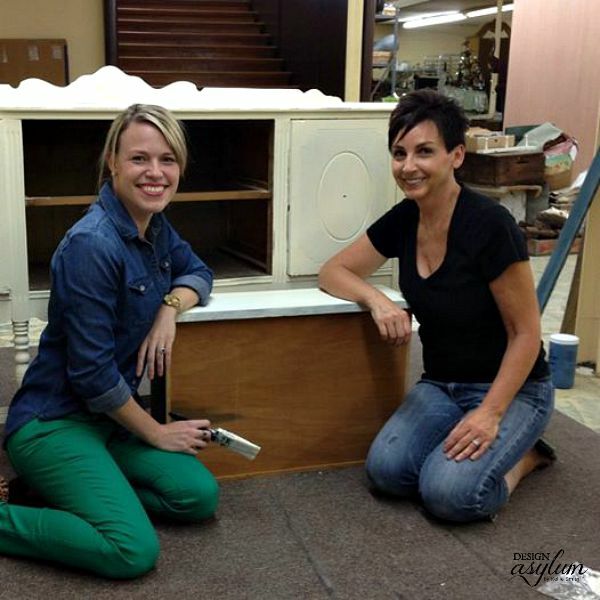 We changed the hardware and Jenna chose gorgeous brass pulls from D. Lawless Hardware. We got Grunt Labor involved. I’m sure The Handler had said something completely inappropriate. That’s Brandon, our video guy, in the background. He’s awesome. No, like seriously awesome…can you imagine me, Jenna and the Handler all in the same room? AND THAT’S IT!!! IT’S THAT EASY!! 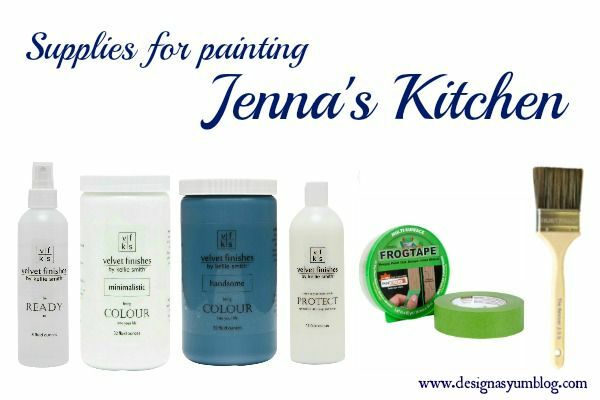 This video shows the entire process of us painting Jenna’s kitchen. Click the photo to watch. Be sure to watch the bloopers!!!!! 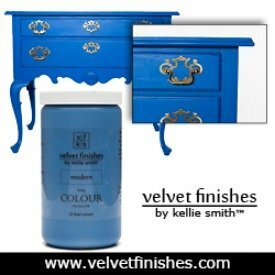 If you are ready for a change, I hope you are inspired to paint with Velvet Finishes!! 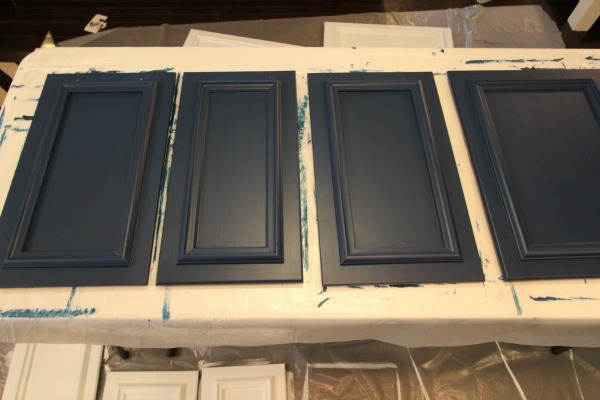 I would not steer you wrong, painting your cabinets with Velvet Finishes is quick and easy, and like I said earlier, it’s a game changer. Oh my word. This post is hilarious. Its also great too because it has pretty cabinets, but its freaking hilarious. Lol, well we do like to have our fun…. Thanks for letting us take over your house for two days during the ice and snow and with G.L. and Landry at home!! Hahahahahaha!! What a trip…that would only happen to us! You’re just lucky we didn’t have to spend the night! Beautiful job here! I love the two different colors that was chosen! I am interested in trying the velvet finish paint. Where can I get it, or how can I try? This is GORGEOUS. We may be refinishing a grandfather clock and if it doesn’t stain the way we want we may paint it. I LOVE this for it. VF is still fairly new Angela, but we are trying to get the word out! It’s super easy to use!! If you have a project in your future I hope you will try it!! Thanks for stopping by! 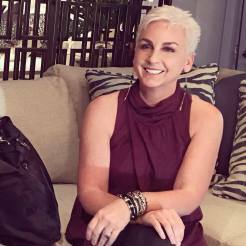 Love Jenna’s blog! 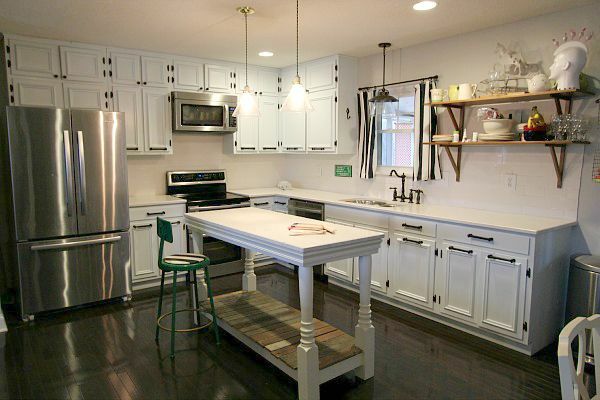 Wow…I thought I love white minimalist kitchen, but DANG…the makeover looks AMAZING! I like how the paint finish looks more matte like. It looks high end and I love that you guys chose to go with navy than the typical, black. Good job! Thanks Jessica!! I love the way it turned out as well. I think Jenna and Grunt Labor are pretty happy too! So yay, right!! Think I would love the velvet touch but think your brain might be a good one to pick on my particular problem with kitchen and bathroom cabinets. Hi Todd! 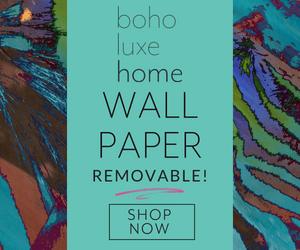 Email me at hello@velvetfinishes.com and I will try to help! I have a project I have been working on ALL SUMMER, it’s a GARAGE BAR, I have finished all the walls in PALLET WOOD and have found some old used kitchen cabinets in the trash, I am installing two counter top surfaces on these cabinets and would like to paint these with VF products, but I want something that’s going to POP..!!! Maybe like some TIKI BAR colors against the darkened pallet wood back drop..??? I would love to hear some of your ideas..?? I have pictures of what I’ve done so far…if that would HELP..??? Wow…kitchen cabinets looks Awesome. I just love the color . I love the protect product, used it on my white kitchen cabinets, non yellowing, easy and dries fast. Can you use this paint on countertops? I absolutely LOVE the look of your kitchen cabinet now. It’s so gorgeous. You should be proud of yourself!! Indeed this kitchen cabinet is fabulous. 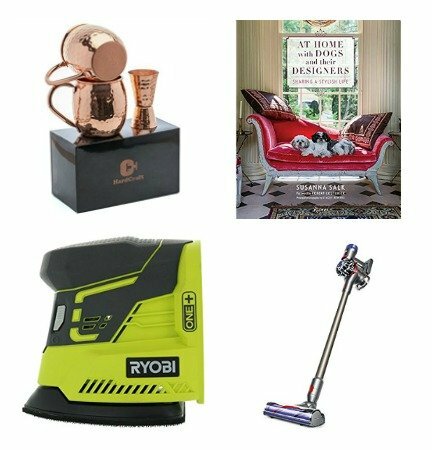 I, too love everything in this post which a great thing. These photos are amazing. Thanks for posting this one.